I have a nail polish to share with you today that was all the rage in summer 2010. This Milani polish was a near dupe to the highly sought after Chanel Jade nail polish that was selling for a couple hundred dollars on eBay. I felt like I won the lottery when I found this color, but now I'm not sure I did. 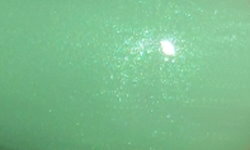 Dress Maker is a light jade green with a matching luminous shimmer. Color: This color is undoubtedly beautiful. In 2015, I can not think of another nail polish that even closely resembles this one. The shade of green is unique and that beautiful lit from within shimmer is original to a color like this. Hands down, Dress Maker is a beauty. Formula: This is where things go awry. This formula is abysmal. In 2010, I would of considered this formula unfavorable, but not abysmal. It's only because formulations on nail polish have improved so much in 5 years I now say it's pretty terrible. This formula is a thin, liquidy, uneven, patchy, and sheer mess. I needed 4 coats to have this result, and I can still see many uneven and sheer spots. . When I wore this recently it never dried properly. I put it on 4 hours before bed, and woke up the next morning with a completely ruined mani by my sheets. This was 4 hours after I put quick dry top coat on it. This is is probably one of the worst formulas in nail polish I've used in the past 2-3 years. Price: You sadly, can no longer find this. It's long discontinued. Overall: If it were not for Dress Maker's rarity and beautiful color I would of easily tossed this in the trash. The formula is that bad by today's standards. I can't part with it though. I'm so disappointed with this one. When I rediscovered it I was so excited only be let down immensely. I was lemming that color to the point of email Milani & asking if they still had any of it left & I got a reply back with their warehouse number & said there might possibly still be some there. But I never called them. Then last year while visiting my daughter in S.C. I saw a couple of bottles in her local CVS. By that time I wasn't that interested in getting it. I don't know if it was some of the old left overs or they brought it back for a while. Now I wish I had bought it :-( However I have noticed that some of my older Revlons don't want to dry either. I wish there was something we could add to them to make them dry right, because I don't want to throw them away, but I can't wear them like that either.